Christian church bombed in Nigeria. Muslim convert disowned by family. We read the headlines, and try to imagine, but it’s very difficult to understand what it’s like to be in their shoes. We love to complain about the demise of Christianity’s cultural acceptance here in the U.S., but we really have no idea what it’s like to lose our home, our family, or our life for our faith. One way to overcome this barrier is to read Christian biographies. The dialogue may be fictionalized, but the stories are true. As we immerse ourselves in the book, we begin to identify with the main character. What happens to them? How do they react? How would we react in the same circumstances? 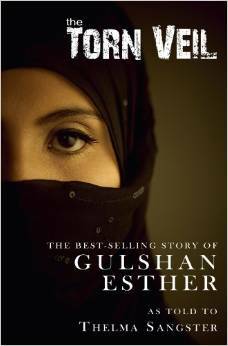 The Torn Veil is the true story of Gulshan Esther, a Pakistani girl. She was born in the 1950s into a devout Shi’a Muslim family. She and her family are Sayyids—direct descendants of Mohammed. As is customary, she is betrothed to a cousin while she’s only three months old, and will be expected to marry him when she reaches her late teens. It seems her life is set before she even learns to walk. Then, disaster strikes. At the tender age of six months, typhoid leaves her left side paralyzed. For years, her family prays to Allah for healing, but no answer comes. Her father takes her to doctors in Pakistan and England, and they offer no hope. She even makes the hajj, believing that she can earn Allah’s approval by submission and obedience, but she remains paralyzed. It seems she must break her betrothal and live a solitary life of shame. Gulshan’s mother had died while she was still a baby. As she grows older, her four siblings marry and move away. She is left at home with her father, her aunt and uncle, and some servants. As she has been brought up in pardah (the secluded life of women) from the age of seven, she rarely leaves her house. The author spends some time describing Gulshan’s daily life, how the members of her household interact, what it’s like living in a well-off family in Jhang, about 250 miles from Lahore. You can easily imagine what it would like to be this young woman, expecting to spend the rest of her life secluded from the world, spending time mostly with her father, to whom she is very close. Then, suddenly, her father dies. Does Jesus heal her body? Does he heal her soul? What would life be like for a Christ-follower in this intensely Muslim family? Gulshan’s believes her life is over, but in fact it’s just beginning. You’ll have to read the book to learn what happens next. This entry was posted in Book, World and tagged Christianity, convert, healing, Islam, Jesus, Muslim, Pakistan, persecution, prayer. Bookmark the permalink.